Sunday evening Participants arrive independently. Transfer from Saudárkrókur or Varmahlíd to the lodgings can be arranged, if required. Monday After breakfast at the lodgings you go across to Lynghóll where we show you around and you will meet the horses. Before lunch, participants will have riding lessons, in pairs. If you wish, video recordings can be made and later analysed in the theory lesson. After lunch we have the theory lesson and then seat training on the lunge. Later on we’ll make a ride for about one hour, surveying Lynghóll’s surroundings. 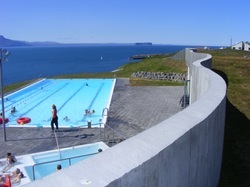 Following a snack at the lodgings we’ll make a trip to Hofsós, a small fishing village, visiting one of the most beautiful swimming pools in Iceland. The morning runs like the previous day, with riding lessons, followed by lunch. After lunch we have a theory lesson. In the afternoon we go on a two-hour riding tour heading for the coast, where we visit the renowned place Kolkuós. For several centuries Kolkuós was the main harbour for northern Iceland. It was at Kolkuos that the legendary mare Fluga, from which the farm Flugumýri owes its name, came ashore and ran away. 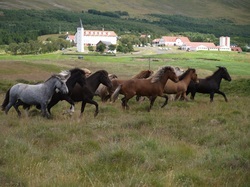 In the 20th century Kolkuós became known for its breeding horses, far beyond the borders of Iceland. The rest of the afternoon is at the participants leisure. If desired, a boat trip to the islands of the fjord (Malmey and/or Drangey) can be organised (not included in the price). The morning runs as usual. This afternoon we will have an amazing ride along the coast, enjoying a wonderful view of the Skagafjordur Fjord (weather permitting). Riding tölt along soft sand trails to the farm Brimnes. Further on along an old track,riding past an idyllic small lake and from there back to Lynghóll. In the morning the final riding lesson of the program. If you wish, video recordings can be made, and you could then compare those to the videos from the first day, thus documenting your improvement. The afternoon’s riding tour is over a small ridge, the Hrísháls. Past the horse breeding farm Enni and on towards the highest point of the trail, hopefully being able to enjoy the breath-taking view of the fjord, mountains and valleys of the Skagafjörður. Going down we ride along an old and fabled bishop’s path. After the ride you can freshen up at your lodgings, before going by car to the old bishop’s seat and University College at Hólar. Following a guided tour around the site, we will visit the Icelandic Horse History Centre. If the participants are interested, we can finish the tour with a visit to the Iceland Beer Centre, located at Hólar. 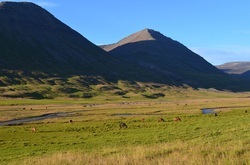 Today we will have a longer ride into the “horse valley” Kolbeinsdalur. Riding along a glacial river, through some mystical landscape into the once densely inhabited valley. Nowadays the valley is used for grazing several hundred horses from the local farms during the summer months. Further on we take the route of the renowned Laufskálarétt horse round-up, which takes place here every autumn. We will make a sort stop at the Laufskálarétt sorting pen and ride back to Lynghóll via the Hjaltadalur Valley. Today we take a day trip to the beautiful Lake Myvatn . 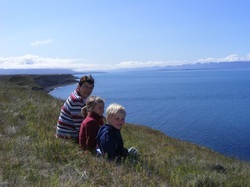 Here, the group can choose between the northern road through the fishing village Siglufjördur or the route nr. 1 through Akureyri. Depending on the route we will make a stop in Siglufjördur or Akureyri and from there we drive to the Godafoss Falls, the beautiful waterfalls of the gods, and then on to Lake Myvatn where we can for instance visit the Dimmuborgir lava formations. Before returning home after an eventful day we will relax for a while in the Myvatn Nature Baths. After a final breakfast at the lodgings it will be time to say farewell.